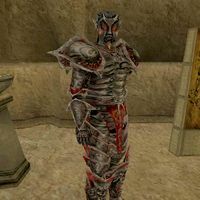 Krazzt is a dremora who can be found in the center of the Puzzle Canal in Vivec. In order to complete the pilgrimage to the Shrine of Courtesy, you must offer him a silver longsword. He seems to feel it is below him to accept longswords constantly and proclaims his disappointment in florid prose. "Are you here on the pilgrimage? Read the shrine." "Are you here on the pilgrimage? Do you have a silver longsword for me?" "Are you here on the pilgrimage? I take it that silver longsword is for me." "Have you not given me a silver longsword? Just read the shrine and leave. I tire of your mortal presence." "I can only accept plain silver longswords. I didn't make the rules." "As you see. I am unarmed. But you are brave and gallant. <sigh> Will you give me your longsword so that I may stand a chance against your might?" Yes, take it. [Your journal has been updated. Silver Longsword has been removed from your inventory.] "Yes, I accept this sword. Thank you, %PCName. You have the grace of courtesy. You should read the inscription on the shrine to complete your pilgrimage." No, nevermind. "Perhaps you should read the shrine again." "I remember you, %PCName. You have already given me a silver longsword." This page was last modified on 22 February 2019, at 06:49.